Our neighbor kindly cut up a fallen tree for us a couple of months after a storm with high winds hit us in the middle of the night. While my grandson, Isaac, and I were picking up the wood and stacking it, I had a thought, “Why not use the thicker stump part as a chair for the grandkids at our s’mores roast?” So we dragged them over to the fire pit and placed them around in a circle. They work great for little end tables too. Fortunately our neighbor cut them to the perfect height and very level. I wonder if he thought of using them this way as he was cutting them up? 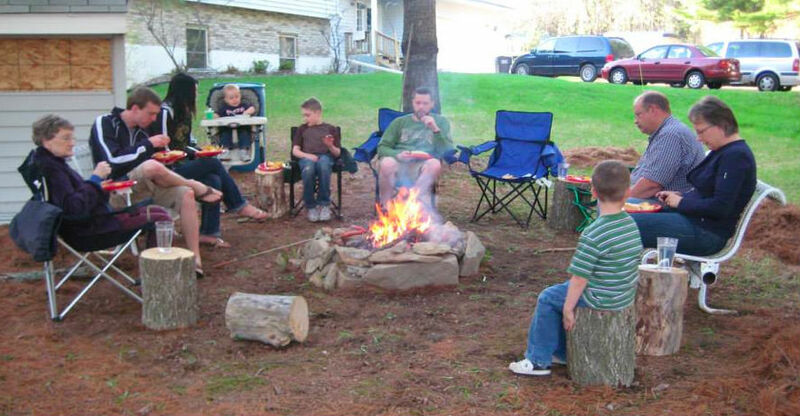 Here’s a picture of a family cook out that I snatched from my daughter’s facebook page showing our stumps in use. Cost for tables and chairs: one dead tree, sitting around the camp-fire with family: priceless. In the picture you can see the Jones family (minus April), the Dack family, myself and Mark, along with my mom.